Recently Crunchyroll updated their manga offerings with three brand new titles. One of the titles in question is Koe no Katachi which Crunchyroll translate as A Silent Voice. The series is on-going and Crunchyroll have added the first 29 chapters of the series with further chapters to be added as they’re released in Japan from the 8th of April. I sped through the current chapters and fell in love with the story very quickly, so I decided to throw a review together. 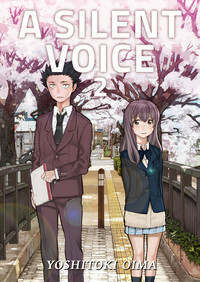 The story of A Silent Voice is centred on Shōko Nishimiya and Ishida Shouya. As a middle school student Shoko transfers to Ishida’s school, but things don’t quite go as well as they could have. Shoko is deaf and because of this is badly bullied by Ishida and the rest of her classmates until she is forced to transfer schools again. Ishida is turned on by his friends and classmates after Shoko transfers away and badly bullied until high school, at age 17 we rejoin a regretful Ishida as he goes to find Shoko and apologize for his actions. A Silent Voice does things quite nicely in this regard, the first chapter shows 17 year-old Ishida about to confront Shoko and apologize, but before we get to see their interaction the story flashes back to Ishida and his friends as kids just before Shoko transfers into their class. The series continues into its next five chapters showing us Shoko coming into class and Ishida’s and the class’ reaction to her joining them and their childish curiosity about her being deaf. It’s a nice way of handling things, we’re shown everything that happens to Shoko and how quickly and harshly everyone turns on Ishida afterwards. The author builds the story and characters carefully, dealing with a very sensitive issue and yet never really putting a foot wrong in how she portrays everything that happens. Ishida is singled out by his classmates after Shoko transfers away and is labelled as a bully until high school. He’s on his own and we watch him mentally drop quite a way before he finally decides to go and apologize to Shoko, which is where our story truly begins. After meeting and speaking to Shoko he realises his life still has some meaning and that he must make amends for his past actions in whatever way he can. It’s an interesting turn of events and definitely a welcome one for the story, not only letting us get to know Shoko a bit better, but also showing Ishida and how he thinks and feels so many years later. It’s an interesting story concept and one that is definitely trying to explore and cover two very important issues at once. This is one of very few manga series I’ve come across, officially translated and licensed anyway, that focuses on a deaf main character. A lot of series would shy away from going as in-depth to bullying as A Silent Voice does as well, and perhaps the fact the author has braved tackling these issues despite all that is a credit to both her and her work. She manages to work both elements hand in hand quite perfectly to create a truly compelling and believable tale. Ishida is a normal everyday kid who just doesn’t think enough and gets swept away by the rest of the class as well as his own excitement. Shoko is a perfectly innocent girl just trying to understand the world around her and make some friends, which perhaps makes it all the worse to watch all these terrible things happen to her. The story makes it clear that Shoko has been bullied previously before transferring to Ishida’s school, which almost makes it more interesting to see how these kids react to her and how the bullying at this school starts and yet truly horrible to watch unfold all at the same time. The series makes you understand everything that happens from every characters point of view, which is extremely thought provoking in the long run. The thing is, the series will make you root for Shoko and perhaps to some extent maybe even Ishida, especially after everything he himself goes through and how set he is on trying to right his wrongs to Shoko. It’s by no means an easy road for him to go down and we watch him second guess himself a number of times, but again the story is a powerful one and will keep you reading and wanting to know what comes next. I was quite disappointed to get through the 29 chapters and then realise I have to wait three weeks before I can read the next chapter, especially considering how that last chapter ends. Generally I can deal with the wait, but a series like this is one where I want to read what happens next right away. The artwork for A Silent Voice is also pretty brilliant in its own right and it’s how the series caught my eye from the start. Shoko is a mildly pretty girl, but putting her aside the rest of the character designs are very normal looking kids and generally don’t stand out. Overall the series can be a little rough around the edges here and there, but it does go into a lot of detail where it needs to and the characters emotions are drawn brilliant. Shoko actually is the best example of the characters emotions being drawn well as she relies on the reader being able to see and understand her emotions if they wish to know more about her considering she can’t actually talk and interact with the characters that way. She can use sign language, which Ishida helpfully explains for the reader by repeating back roughly what she’s saying either to himself or to whomever he’s with, but beyond that we’re relying on the author being able to bring her to life. It’s something small that pays off wonderfully; it’s really nice to see how well Shoko is handled and it just strengthens the overall feel of the series. 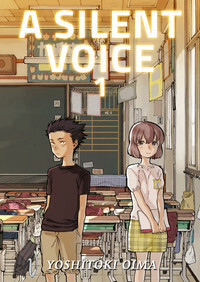 In closing: I’d highly recommend A Silent Voice to anyone looking for a deep and thought provoking series. Recently the author commented that the series will likely only go on for about another three volumes, so the total number of volumes should stay under ten whatever happens. With that in mind and the fact Crunchyroll are publishing the series on the same day as it’s released in Japan there is very little excuse for not giving what is quickly turning into a true gem a try. This entry was posted in Manga, Manga Reviews, Reviews and tagged A Silent Voice, Crunchyroll, Koe no Katachi, Manga, manga review, Review on 17th March 2014 by Demelza Ward.